If you listen to a lot of podcasts, or don’t use an ad-blocker when browsing the web, or just talk to people in your day to day life, you’ve almost definitely heard of at least one or two these “mattress in a box” startup companies that will ship a mattress right to your front door, for quite a bit less than it costs to buy a mattress from a furniture or department store. I went to a certain part of town that’s filled with furniture stores, with different ones on every single corner, for blocks. The experience was a mixture between high-pressure sales from staff working on commission (Frankly kind of aggressive, and ultimately rude…), or people who couldn’t really be bothered to help at all. What’s worse is they make it nearly impossible to find reviews, since every store seems to have totally different model numbers. How are you going to compare brands like Sealy or Serta to one another when you can’t even compare the Serta mattresses at one store to the Sertas they’re selling at the next store. I ended up sick and tired of the whole process, and I went to a local department store that was having a sale (That’s’ a whole other can of worms, mattress “sales”.) It was a mattress that allegedly was priced at around $1499, on sale for $599. Hey, what a steal! Why would I buy the $1500 mattress when I can get a $1500 mattress for only $599? I just wanted to get it over with. I bought the bed, it was okay. Just okay. Better than my old mattress, but it didn’t feel as good as it did in the store, and it didn’t feel as good as the “real” $1500 mattresses I had tried in stores. After a few years, it was sagging pretty badly, the springs were loud and creaky, and I wanted to try out a memory foam mattress instead. It seemed like there had to be some kind of middle ground, and that’s when I started to notice the mattress-in-a-box trend hitting Amazon. I can understand why the “big brands” of memory foam mattresses have to charge a lot because they’re advertising all over the place and basically had to build a new product category of internet mattresses from the ground up. But after the initial wave, it was only a matter of time until more options became available. I ended up getting a memory foam mattress online for about a third of what bigger mattress startup brands were charging. 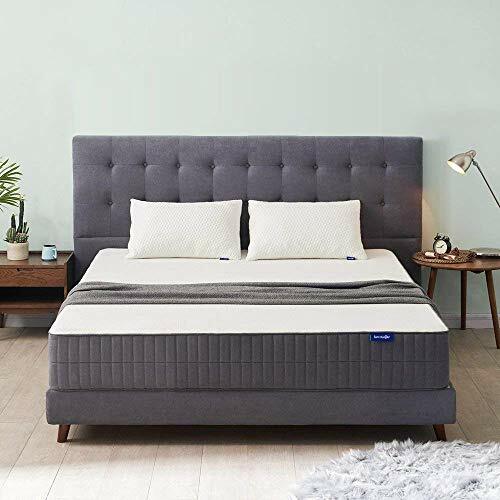 By getting it on Amazon, you’re buying on a competitive marketplace, so there is a lot of competition which means you can find better mattresses for less money. Don’t get me wrong, I’m sure the bigger mattress startup brands are excellent too, but when you can find something on Amazon for a lot less money, that’s INCREDIBLY comfortable, how can you not? I placed my order, a few days later my mattress showed up, and it was love at first nap. My mattress in a box arrived at my door, exactly as described, and it was more comfortable than I thought – especially for the price. I got a better mattress, for a better price, and a much better sleep – for way less than my last spring mattress cost, and even way less than the typical “internet mattress”. And now, the folks are Sweetnight want you to know about their 10 gel memory foam mattresses. The first thing that really stands out with this mattress is the price tag. It’s super affordable, but still costs enough that you know you’re getting something substantial here. It has multiple layers of form for comfort and support, arrives conveniently in a box and it’s easy to setup. You get an amazing 10 year warranty, and most importantly – a great night’s sleep. If you’re looking for a new mattress, and you want something that’s high-quality and super comfortable that’ll last you a long time, but without spending three rent payments on it, Sweetnight’s product line is absolutely worth considering. Do your research, see what the different options are out there, because it’s hard to find a better value. There are some less expensive choices out there, but just from looking at them you can tell they’re not the same quality, whereas the one from Sweetnight is clearly a lot closer to the high-end, $1000+ mattress than the cheaper $100 or $200 ones you’ll see. It’s a perfect middle ground when it comes to price, but the quality is through the roof.